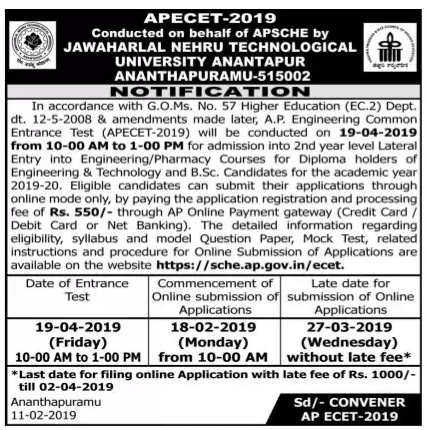 The AP ECET Notification 2019 has released by the officials of the Andhra Pradesh State Council of Higher Education at the official website @ apecet.nic.in. So, students who are waiting for this notification, those ones can apply for the Andhra Pradesh ECET Notification with the help of the mentioned links on this web page from 18th February to 27th March 2019. Through the online mode only, candidates can submit the AP ECET Application Form. On 11th Feb 2019, we will upload the starting and ending dates of the application forms. So, students who are very eager to apply for the APSCHE ECET Notification to continue the further studies, those ones must and should apply now. AP ECET Exam Date Postponed !!!!! Latest Update On (05th April 2019): AP ECET Exam Date have been postponed From 19th April 2019 to 30th April 2019 due to technical Reasons. The details about the APSCHE ECET Notification has mentioned on this page. 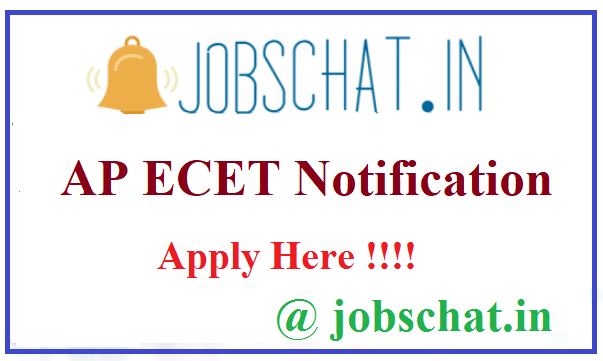 So, candidates who are searching the internet for the purpose of the collect the eligibility conditions of this notification, those ones just refer to this web page and apply for the AP ECET Notification 2019. Students before going to apply for this notification must check if you have related education qualification, age limit, and more other eligibility conditions, which is mentioned on the below page @ www.jobschat.in. Because if you have the mentioned qualification, then only you are eligible to apply for this apecet.nic.in Notification. We know that all the graduates are looking for the AP ECET Notification 2019. For that reason, we are come out with the full details about this notification on this page. So, students just read the whole article by scroll down the web page and apply for the APSCHE ECET Notification. On the Last Week of the Feb 2019, the application form download links will be activated on this web page. So, candidates bookmark our website to know the latest updates of the AP Engineering Common Entrance Test Notification. Addition to this, students also get the details of Andhra Pradesh Government Jobs, by just click on the mentioned link on this page. Applying Students must and should have the 3 years B.Sc Degree with Mathematics from the recognized university or board and others must have the obtained a Diploma in B.Tech/ Pharmacy from the State Board of Technical Education of Andhra Pradesh State. Students must and should secure 45% marks for reserved candidates and 40% for unreserved candidates. By just click on the highlighted link on the below table, candidates can get the Andhra Pradesh ECET Application Form. So, students who are willing to apply for this AP ECET Notification 2019, those ones just follow our instructions and enroll your name in this notification in an easy manner. At the end of this page, we have uploaded all the necessary details of the application process and registration links. So, candidates after checking the eligibility conditions apply for the Andhra Pradesh ECET Notification 2019 with the provided links. Students take the copy of the AP ECET Registration Form after completion of the application process. Because without knowing the application number, we can’t check the further details. The officials of the Andhra Pradesh State Council of Higher Education has declared the exam date for all the applicants i.e 30th April 2019. So, candidates after the completion of the application process in the AP ECET Notification 2019 must download the Syllabus, which is very useful while in the preparation of the exam. Candidates if you want to know more details about the APSCHE ECET Notification, once visit the official website, the links are provided on the below table. Finally, students remember one thing, must and should submit the AP ECET Application Form before the last date of the application process.